A tabby cat who enjoys hanging around the Harvard Law buildings has attracted fans online after one professor shared an adorable snap of the furry creature. Professor Annette Gordon-Reed shared with followers on Twitter Tuesday the moment she met Harvard's neighborhood cat while at the law school in Cambridge, Massachusetts. 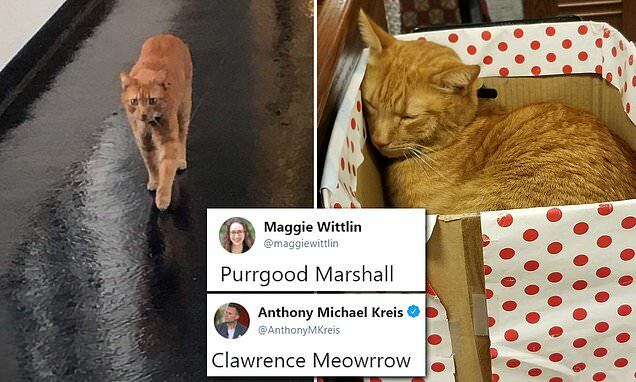 'Well, here’s something you don’t see everyday: a cat wandering the halls of Harvard Law School,' she wrote in the tweet. People loved the picture of Remy walking through that halls and it has been liked more than 15,000 times since Gordon-Reed posted it on Tuesday. Harvard students and staff responded to the tweet to provide more context about the stray cat. .